The weather is finally getting warmer! For me, this means it’s the beginning of stand up paddle boarding season. 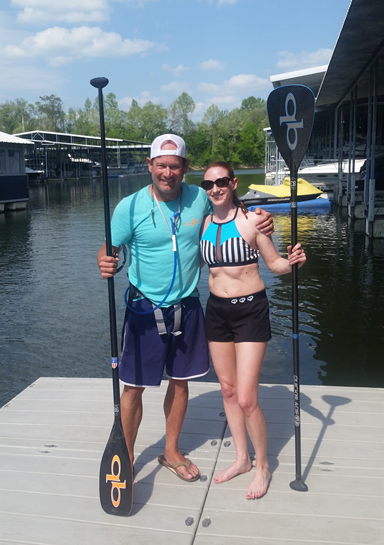 Just last week I had the opportunity to train with former canoeing Olympian and pro paddle boarder, Jim Terrell, also owner of Quickblade Paddles. He taught me advanced level paddle techniques so I can increase my speed and perfect my paddle stroke. If it’s not already obvious, stand up paddling (SUP) is one of my passions. In fact, I love it so much, I’ve found a way to incorporate it into my passion and career coaching business. Well, every paddle season, I take my clients out for a beginner SUP lesson. This is easy to do since I have two paddle boards and have previous experience teaching beginners. The purpose of taking clients out paddle boarding is to get them out of their regular environment which gives them a different perspective on their current situation. It also melts away their current stresses and rejuvenates their thought process. The session starts with about 20 minutes of basic SUP instruction for them to start feeling comfortable on a board. At first they’re worried about falling off the board into the water. It’s all they can think about as they attempt to stand up on the board for the first time. Once they start to get the hang of it, we begin our typical career coaching discussion to go over the client’s current needs as we paddle down the river. They suddenly realize they haven’t thought about it all. It’s kind of like a light bulb moment where they realize they accomplished something they weren’t sure they’d be able to do. At that moment I can see a huge boost in their confidence. They begin noticing all the nature surrounding them and realize how much the water has calmed them from their worries and stresses about their career troubles. I love to hear that from my clients. What they don’t expect though are all the parallels between the beginner SUP lesson and the life and career lessons from our coaching sessions. At the end of the paddle session, I give my clients a copy of those lessons for them to keep and to remember. SUP: Always be safe – use proper equipment, stay out of boat traffic, know when to return to lower your center of gravity. Life and Career: Prepare and plan for potential life and career bumps and crises. SUP: Select correct fit for board size and paddle length. Life and Career: Understand the importance of fit for career choice. SUP: Hold the paddle correctly. Life and Career: Use the tools you’ve been given to succeed correctly. Life and Career: Reach further and dig deeper. You will learn more about yourself. SUP: Keep your paddle close to the board’s rails so you can paddle straight. Life and Career: Keep close to your core values to stay on the straight and narrow path. SUP: A wider stance on the board makes the board more stable. Life and Career: A wider network and a wider set of skills equals a more stable career. Life and Career: Keep your eye on the horizon. Don’t look down and don’t look back. SUP: Once up, you will stabilize as soon as you put your paddle into the water. Life and Career: You have to stand up and risk feeling insecure before you can feel secure again. A little fear, discomfort and unstableness can be a good thing. SUP: If you fall, you should fall away from the board. Get back on the board in the middle from the side, never from the back of the board. Life and Career: If you fall, get back up. There’s no need to start all over. Just pick up in the middle where you left off. SUP: Stay on the sides of the river (10–20 yards from river bank), do not cross in front of boats or barges, and do not paddle in the middle of the river when there’s boat traffic. Life and Career: Stay out of the middle of unnecessary drama. SUP: Pay attention to the river’s current – when it’s stronger, go upstream first so you won’t be too fatigued coming back. Life and Career: When feeling overwhelmed, it’s best to deal with the bigger/tougher issues first so you won’t have to exert too much energy when you’re already tired at the end of a task. SUP: Handle wake by paddling straight into the waves or return to your knees to lower your center of gravity. Life and Career: Face challenges head on, and know how to pick your battles. SUP: Pay attention to headwinds and tailwinds. 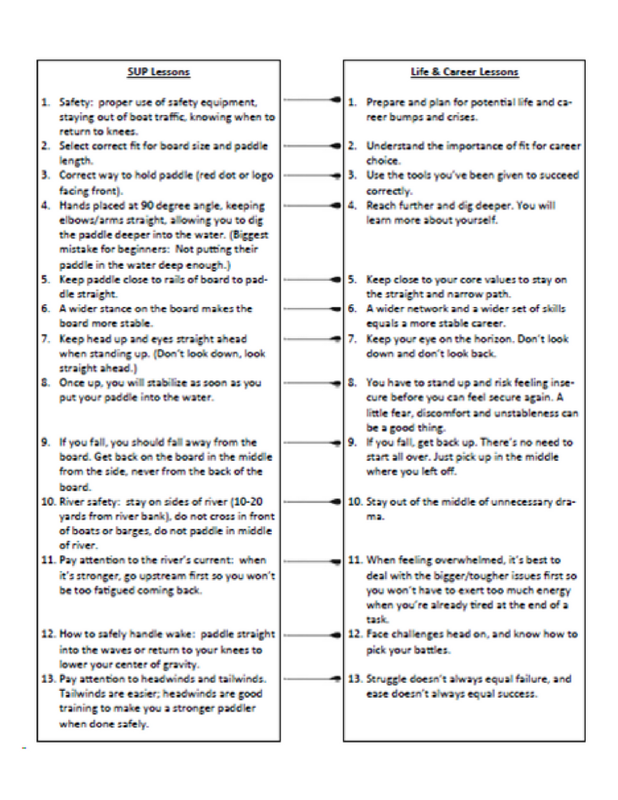 Tailwinds are easier; headwinds are good training to make you a stronger paddler when done safely. Life and Career: Struggle doesn’t always equal failure, and ease doesn’t always equal success. One of the reasons why I love sports and recreational activities like SUP so much is because of all the life lessons they provide us. What are your passions? What life lessons have you gained from them? Please respond and share!